A terrific chicken recipe using the pan rushing technique (see directions), served with saucy apples and fresh sage. 1. Match your favourite heavy frying pan or skillet with a tight fitting lid and medium high heat. Splash and swirl in enough vegetable oil to cover the bottom of the pan, then swirl in a dollop of butter. Add the chicken breasts, searing their first side until it’s golden brown and crusty, about 5 to 7 minutes. Flip the breasts and continue searing until side two is equally golden brown and delicious. Add a splash more oil if you think the pan needs it. The goal here is not to fully cook the meat but just to add lots of brown flavour to the works while the pan temperature is high enough. 2. Reduce the heat to medium and remove the chicken breasts to a plate. Add the onion and garlic, sautéing for a few minutes until fragrant. Add the apples, cider, vinegar, mustard and dried sage. Adjust your heat to bring the works to a slow, steady simmer, not a rapid boil. Return the chicken to the pan, cover tightly and continue cooking, simmering the sauce and baking the meat until its cooked through and delicious, and registers an internal temp of 165ºF, 10 to 15 minutes. Turn the breasts once during the simmer, to allow the apple flavours to fully permeate from all sides. Add the fresh sage leaves. 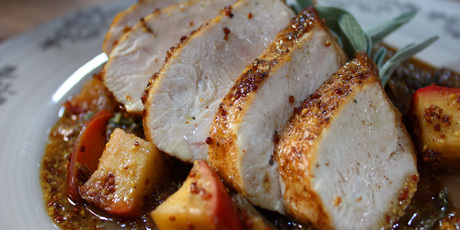 Plate the finished chicken breasts, spoon on the saucy apples, serve and share.